Ask the best mechanics in the game and they will admit that without a reliable wrench air compressor, your impact wrench will not work as well as you would hope. To put it simply, wrench air compressors are a complete necessity for most if not all DIY tasks. After all, air compressors can supply a reliable power source not just for impact wrenches alone but for other tools as well. They are the workhorse of any workshop. If you are in search of the best wrench air compressors, you are in luck. We conducted hours or research considering different customer reviews to come up with a list of 5 of the best wrench air compressors 2018 in the market. At the end of our list, we have also included an in-depth buyers guide to help you determine what features work best for you needs. 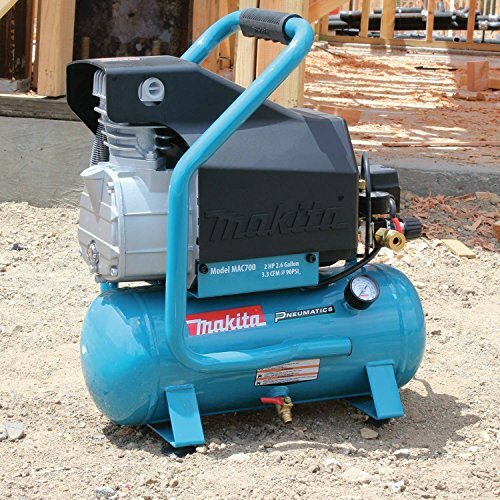 What is the Best Wrench Air Compressor in April, 2019? 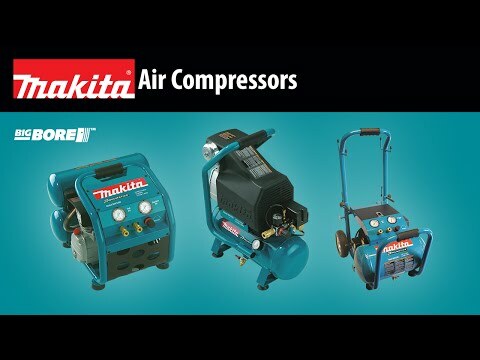 Let’s kick off with an air compressor from Makita, one of the most renowned manufacturers with leading-edge innovation not to mention tools that deliver strength and reliability. 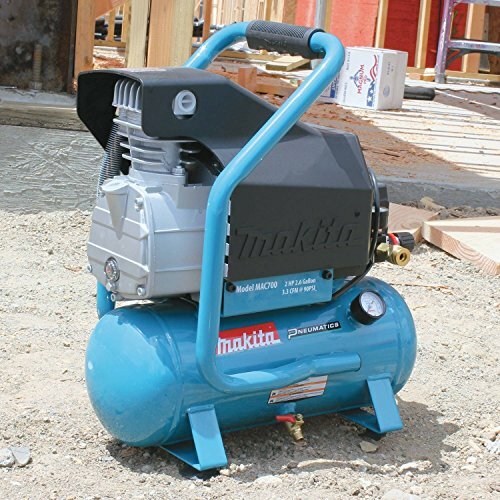 If you are going for fast performance, the Makita MAC700 makes a decent choice. It comes with a 1720 RPM pump that is powered by electricity while producing greater displacement at low noise levels. The entire air compressor is powered by a 2.0 HP motor that comes wrapped in an iron construct built for the toughest job you can throw at it. For portability, you get a roll bar handle. You also get a tank drain valve that works well to make maintenance easier than what you would find with other designs. There is more, with a 2.6-gallon tank, this air compressor works well at a PSI of about 130 while being able to deliver a 40 PSI or a 90PSI comfortably. When it comes to performance, the Makita MAC700 is a go-to for those looking for powerful and reliable performance for industrial heavy duty level tasks. It’s a product that boasts of Makita’s one year warranty like every other product from Makita with only a few users complaining of leakages and faulty deliveries. It’s built to last and most users report of finding it useful even after long-term use. So basically you can use it for 10 years with only minor maintenance issues. The only part about this compressor you will have to consider replacing is the pressure valve as it tends to wear and tear if you need to work with PSIs beyond 135. With the Bostitch BTFP02012, DIYers and mechanics can now breeze through some of their most demanding DIY projects with ease. How do you ask? 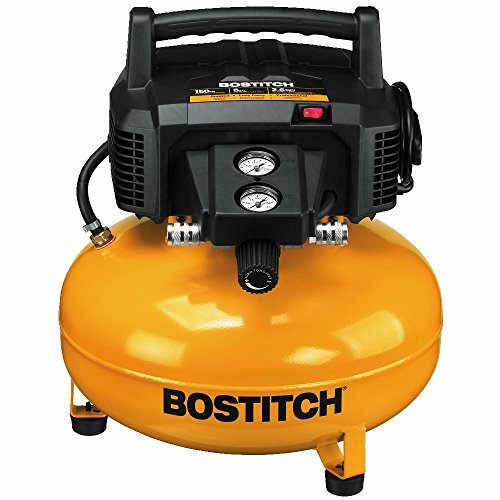 Well, this air compressor from Bostitch brings about portability and performance in a lightweight construction that that comes with an oil-free maintenance pump that can deliver up to 91 PSI. You also get a sufficient 120 PSI storage tank and only 78.5 DBA levels of noise that is suitable for quiet workshops and working environments. Boasting of Bostitch’s mark of quality, this air compressor is not only easy to start but also built to tough it out even though winter. You can, in fact, maximize the performance of your air tool thanks to its high flow regulator that comes with two universal couplers to enable you to work with more than one tool. If you are looking for a wrench air compressor that will allow you to work even in the cold of winter this product might be a good fit. It only weighs 29 lbs giving you easy storage and portability around your workstation. However, the Bostitch BTFP02012 does not perform well for those looking for a high degree of pressure control. Most of the time, you will have to compensate for the pressure loss even with a precise gauge. 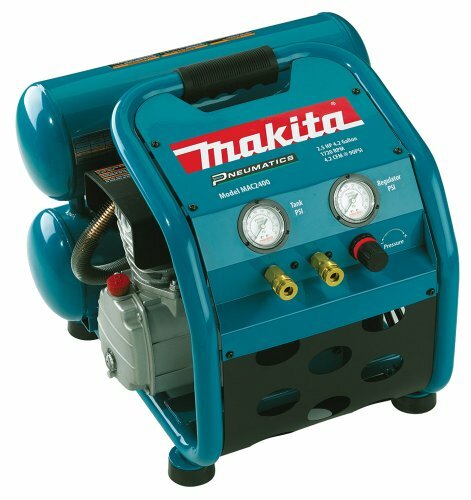 It’s pretty clear by now that Makita is one of the most popular brands in the wrench air compressor manufacturing business. With years of experience backing up its development team, this manufacturer brings about innovative products such as the Makita MAC2400. 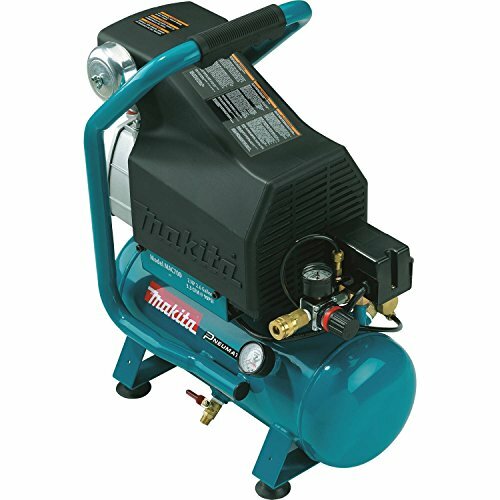 This here is among the few air compressors that enjoy more than the 4.5-star rating on Amazon and for a good reason. It comes with a cast iron pump and a big bore cylinder not to mention a piston designed for fast and improved performance. With an oil lubricated pump, this air compressor is known for running at low cool temperatures that ultimately reduce wear and team increasing the lifespan of the pump. In fact, thanks to the durable cast iron you can worry less about maintenance on a regular basis with this air compressor. From durability to the level of noise it produces and even its portability, the Makita MAC2400 is simply a beast even though it comes at a higher price tag than its rivals. You get a one year warranty with it and a best in class innovative engineering that simply improves your productivity. If you are planning you use it in an extremely busy environment, you will be pleased with its roll cage that protects the air compressor from damage. This means you can use it in any professional working environment. Obviously, the Makita MAC2400 is overkill for most home-based DIYers. But its industrial air filter is great for those DIYers who are looking for more efficiency as the list of projects they plan to work on gets bigger with experience. The only downside is that is a bit expensive, however, for the features, it comes with, you will realize that it’s worth the money especially if you need a quiet pump. Besides, the versatile design and the range of functional features this air compressor comes with has received a bunch of positive reviews with some users going for more than one just to satisfy their needs. Tank (twin stacked): 4.2 gal. 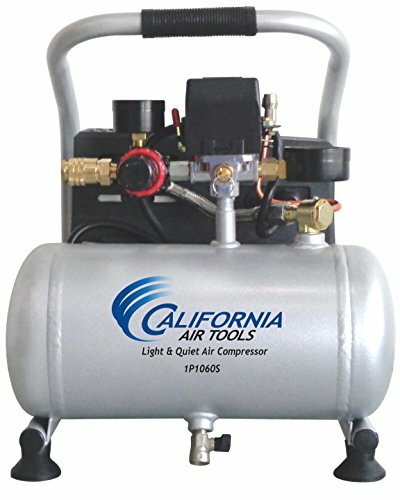 If you are looking for an extremely lightweight air compressor that allows you enough portability for your small garage workshop at home, be sure to check out the California Air Tools CAT-1P1060S. It comes with an ultra quiet 56-decibel pump that works really well for mechanics looking to work in quiet environments. In terms of portability, you can count on it to make work easy thanks to a lightweight portable design that only measures about 30 lbs. If that is not impressive enough, you will love its 1-gallon steel tanks no to mention the oil-free pump that makes maintenance that much more manageable in the long run. 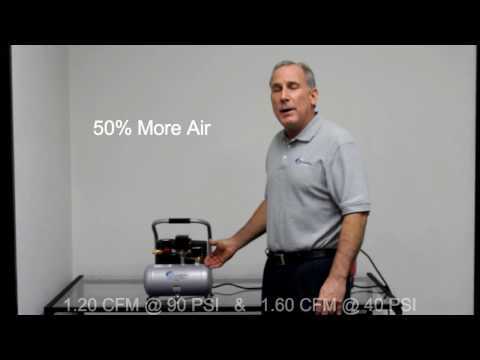 With a 6 HP motor that runs at 1680 RPM, you don’t only get a quiet air compressor but also a high-performance product that is easy to transport. It comes with a 1 Gallon air tank made out of steel with a piston pump designed to give you 300 hours of productivity which s great. You can even use it in a variety of temperatures and in different terrains thanks to a 1.2 CFM at 90 PSI that it produces. 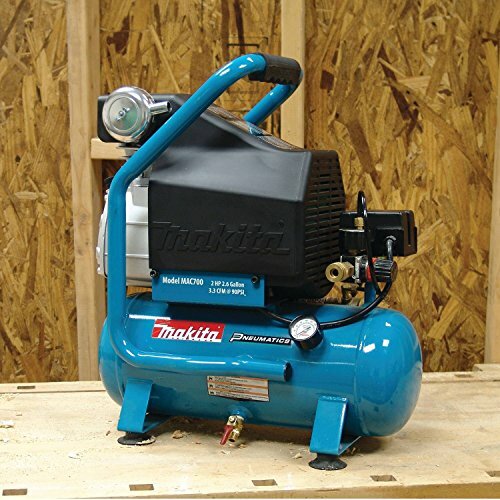 Whether you are working with a staple gun, a brad nail gun or a ratchet wrench, this air compressor is one of the best options. It works well for quiet working environments thanks to a paltry noise level of only 56 decibels of sound. It is designed for the ultimate DIYer who is looking for an air compressor to inflate tires, toys and other cleaning tasks but still packs the punch and performance that professionals will find useful. Lastly in our list is the PORTER-CABLE PCFP02003. 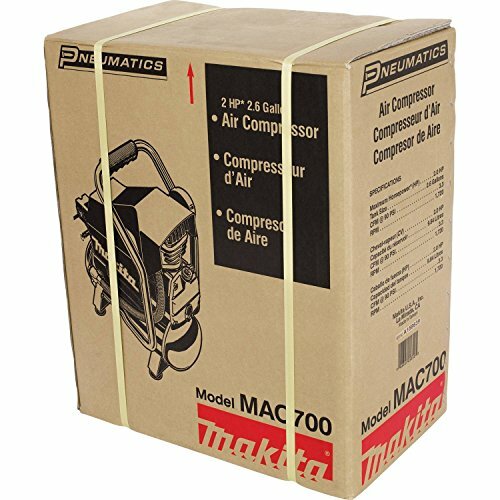 Apart from its unique ‘pancake compressor’ design, this air compressor stands out for its affordability. It is one of the cheapest wrench air compressors that do not compromise in quality performance. The PORTER-CABLE PCFP02003 comes with an air delivery of 2.0 SCFM at 90 PSI enabling quick recovery especially thanks to a maximum tank PSI of 135. It comes with a solid oil-free pump that is known for low maintenance and higher lifespan. With a 3.5 gallon tank and a low amp motor of 120v, you can expect this air compressor to tough it out in the cold of winter thanks to a factory installed coupler that easily gives you access to air regulation. 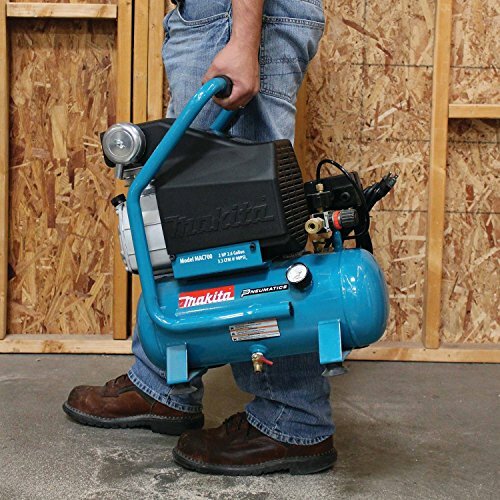 With a weight of only 26 lbs, this air compressor is one of the most portable air compressors we have on our list. It also comes with 2 gauges and a design that supports trim finishing nailers, and other smaller SCFM air tools. Obviously, there is a reason why we never put this air compressor at the top of our list even with its affordable price tag and impressive features. It is quite the noise maker at 82 dBA plus it does not come with an air hose meaning you will have to add a 6-inch hose when you get it. If you don’t already have a hose, we suggest you order a 25-inch curly hose to get the best out of it. Even though it has a couple of downsides, this air compressor still makes up a good pick for those looking for a decent basic compressor. It offers a great choice for portability if you need a small air hose to move around the house for small projects and it is durable enough for DIYers who enjoy working with brad nailers, staplers or inflating car tires. The world of air compressors is full of so many options, but with the list above, you have your pick of the best there is. However, how do you make a solid decision on what works best for you, after all with so many options to go for, it can get confusing when you don’t know what features to consider. Without further ado, here are a couple features you should pay the most attention to if you want to get the best deal. It goes without saying that the budget comes first when buying any product and air compressors are no exception. Even though they don’t come cheap, you don’t have to spend an arm and a leg just to get what you want. 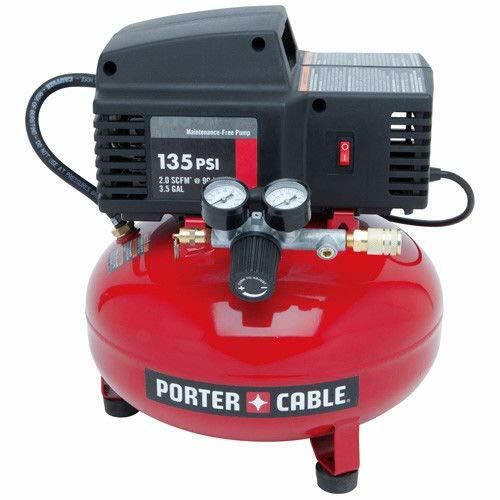 As our list will show, there is a wide variety of air compressors available at different prices. However, if you plan to work on heavy duty tasks at a professional level, a good idea would be to go with an air compressor with the right features that justify the high price. But, if you only plan to work on small DIY tasks at home, going with an industrial grade air compressor would be overkill on your budget. Size matters, Period. If you want to work on heavy duty tasks a bigger tank size will do a much better job. If you are going for portability with an air compressor that can be used around the house, however, a smaller size will do just fine. Larger tanks usually come with dual outlets that allow you to work with multiple tools at once. This can be a huge advantage towards productivity for professional mechanics that have many projects to tackle. Be aware however of larger tanks that come with low PSI. Such air compressors can really disappoint when it comes to performance as such air compressors rarely increase your output. To be on the safe side, make sure the workhorse large size air compressor is able to handle the workload by checking to see whether the size of the tank corresponds to the maximum PSI of the tank. Size matter when talking about portability, however, even with a large size tank, you might find that some air compressors offer more in terms of portability than smaller sized tanks. How does this happen? Well, some air compressors come with wheels and steel cages that make portability a breeze. You can move them around the work site if you are a pro mechanic or you can simply carry them around the house if you are handling small DIY tasks at home. Be sure to check for options that allow for easy portability before making a purchase. The Pound per Square Inch is one of the features that make or break any air compressor. Basically, a higher PSI the less time required filling up the tank or even handling heavy duty tasks around the workshop. If you are only planning to inflate tires among other small tasks, going with a low PSI will work just fine. However, higher PSI levels are significant for professional mechanics and technicians. Here is where you also have to think about the size once again. With a smaller tank and a higher PSI you might end up with wear and tear on the unit plus it’s a complete waste of energy. Get a big tank with a high PSI level to get the best results. Once you have determined the PSI level that you wrench can handle, making a decision on what tank size and PSI you will go for becomes easy. You should also think about think about the noise level your air compressor produces. Air compressors can get super loud. If you are working in a quiet environment, it can be a problem. 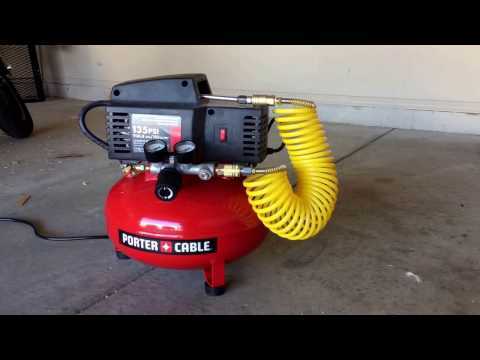 What we recommend is that you go with an air compressor that produces noise levels below 50 deciles. If you don’t mind the noise, however, an 80 dB and below can also work well as a moderate option. You need to know how you are going to use the wrench air compressor before making a purchase. This way, you can prevent breaking the bank to go with a feature you rarely use. Keep in mind that some consume a lot of air and with larger tanks; you will need about 90PSI at an SCFM rating of 0.6-3 just to get sufficient level of performance. Overall, you now have all the information you need to make an informed purchase. Be sure to take a look at our recommendation and check out our buyers guide to know what might work for your needs.